On Tuesday, September 24, at the Fellowship Place Clubhouse, Fellowship Place’s Career Development Services honored members for their outstanding achievements in pursuing their individual career goals. Recognitions and awards included successful employment, academic achievement, volunteering in the community, completing an internship, and graduating from the Career Development Program. 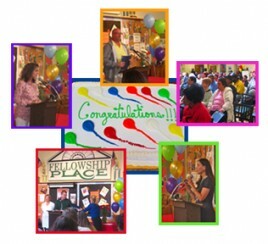 The Career Development Department at Fellowship Place provides a continuum of prevocational & vocational services to help members develop the skills and confidence required to find and keep a job in the competitive marketplace. Services include on-site, paid internships in clerical services, food services, and maintenance, and placement in competitive employment at local businesses. Supported education services are available for those interested in returning to school. GED classes and literacy tutoring are also offered on campus as well as assistance with enrolling in post secondary education programs.